In 2012, the Edmonton Valley Zoo opened the Arctic Shores, Pinniped Exhibit, showcasing seals, arctic foxes and ground squirrels in their natural landscape. F&D Scene Changes worked in conjunction with the Valley Zoo, Studio Hanson Roberts (Exhibit Designers), AldrichPears Associates (Interpretive Designers), PCL Construction (General Contractor) and Group2 (Architects). F&D designed and constructed ice blocks for the seals to slide on in the pool as well as a realistic looking Pingo Cooler, complete with an ice wedge embedded into the landscape. A research cabin and sled has hardware and tools for visitors to explore as well as faux meat and stretched seal skins which are hung to dry, creating a realistic snapshot of life on the Arctic Shores. 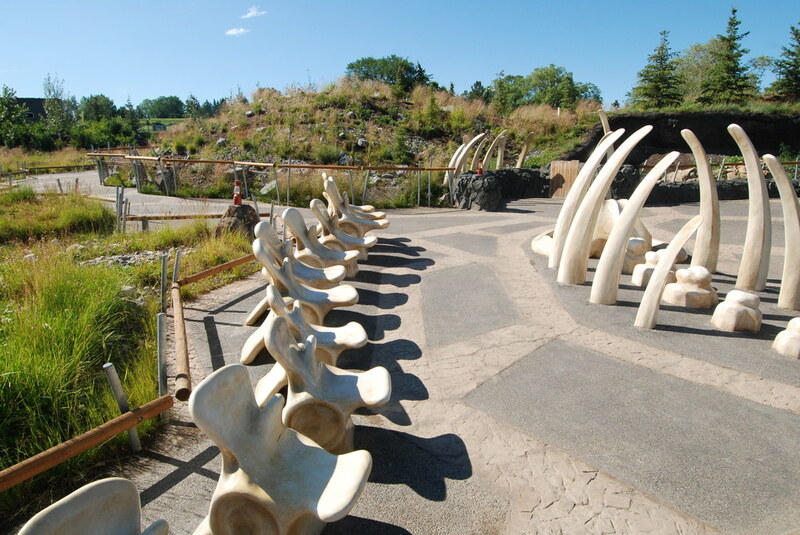 A fiberglass sculpture of a mother sea lion with her pup greets the visitors and beckons them to sit and relax amongst the whale bones and play area – an area which captures the raw beauty of this seldom-seen landscape. These elements, as well as the glass entrance sign and interpretive signage, are all very unique to this exhibit. They help to show how multi-faceted a project can become when exhibit design and theming coordinate their talents.